I used my Rebel T3i on Manual plus my Lumix FX 700 Digital, both on tripods for my photos this week. The various backgrounds were the pie safe, a tilt top round little pedestal table, a painted shutter, framed watercolour and my home made light box. Edited with PicMonkey. 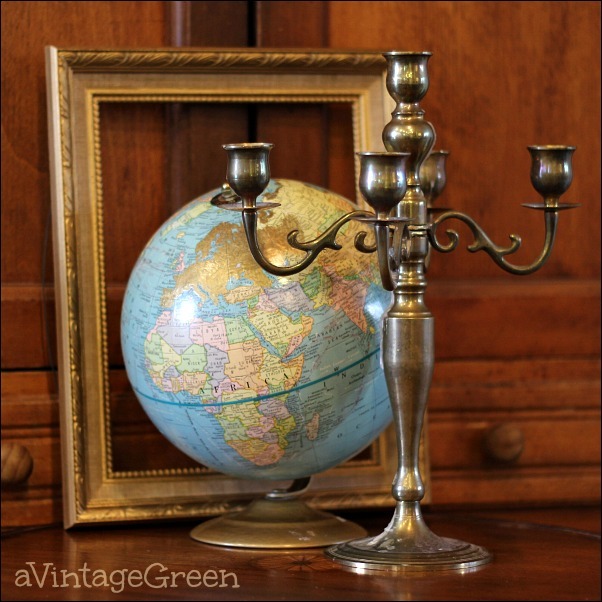 A vignette with a gold/linen coloured frame, a small globe that come with some extra 'gold' paint, and brass 5 Candle holder complete with melted wax. 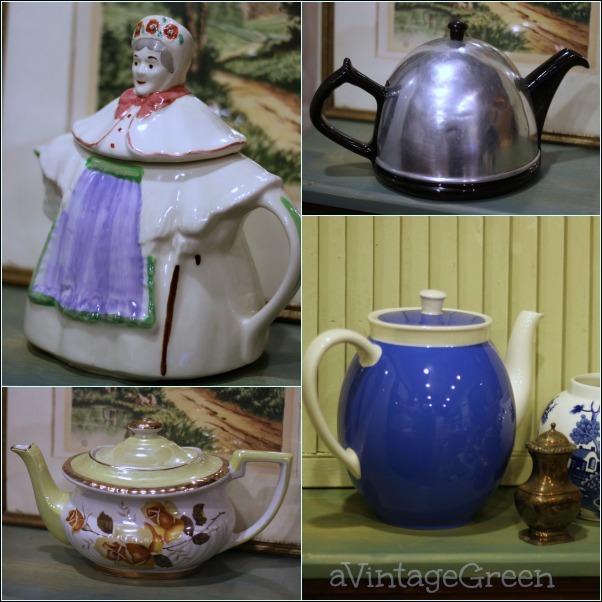 Shawnee Granny Ann, Aluminium Cozy on Black, Zurich Villeroy and Boche and Gibsons Georgian teapots. 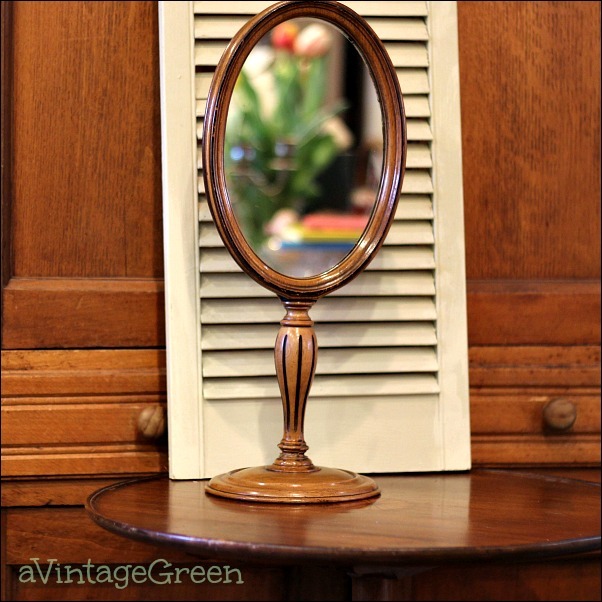 Very old Small Oval Mirror on Pedestal. Turned the mirror towards a bouquet of tulips and a pile of children's books. 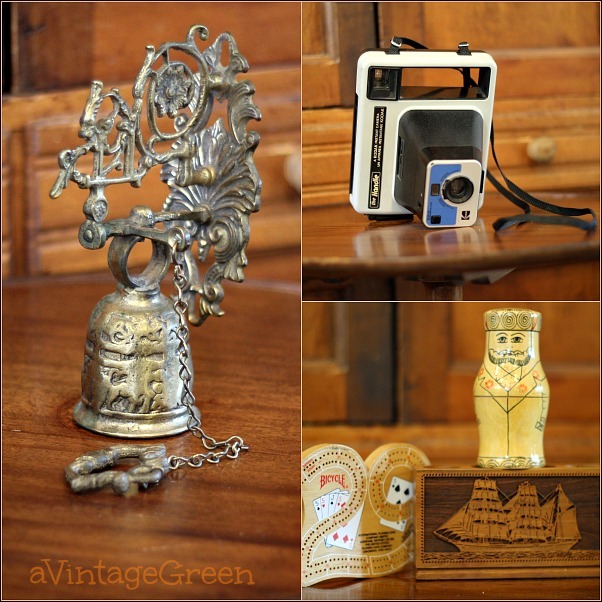 Ornate brass Wall Bell, The Handle Kodak Instant Camera 1977, Carved ship pencil holder with a 29 Crib Board and a Russian doll. 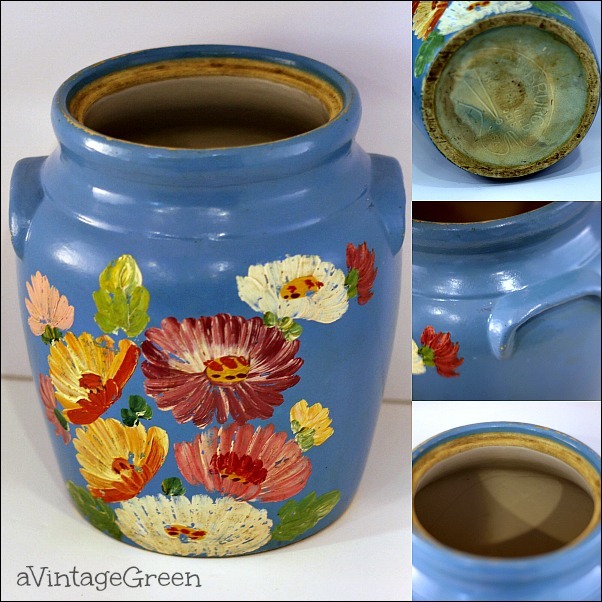 Ramsberg Hand painted blue cookie jar, 1930 era. 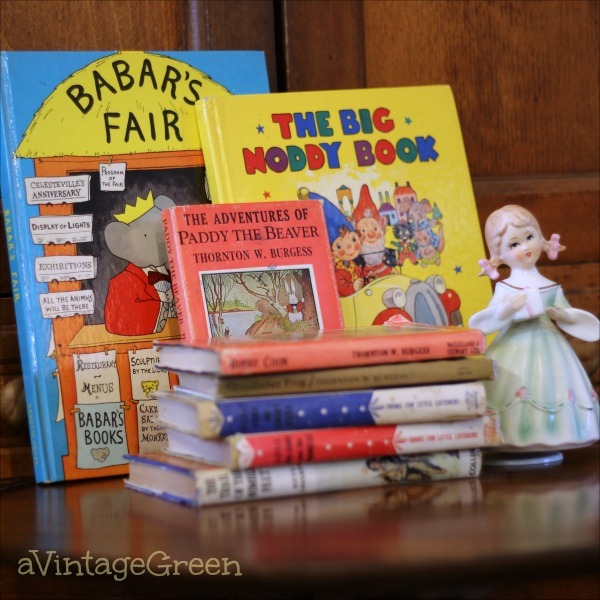 Babar and Noddy, Thornton Burgess and more, sweet children's books and a musical little girl ornament. 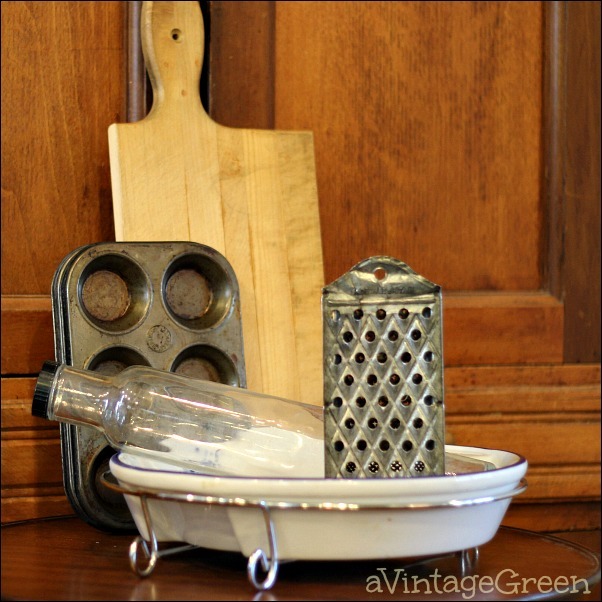 Writing two posts about garage sale and thrifted finds worked well this month. I have a record of what I found and had fun taking the photos. My most funky junky find was a home made pet carrying case. 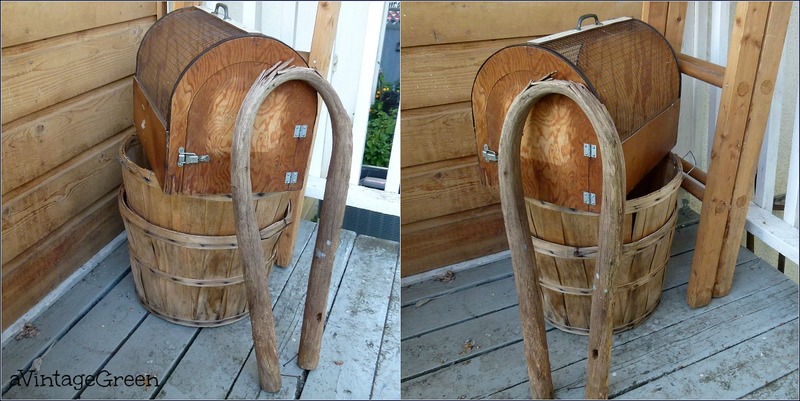 The curved wood is a neck harness for a long gone oxen harness set. Love all of your finds - especially the cute oval mirror on pedestal. Lots of good finds. Love the globe and the kitchen misc. Great finds, my favorite is the hand painted cookie jar.. Love the color, I'd also like the mirror on a stand. I love that first photo with the globe. Lovely items. 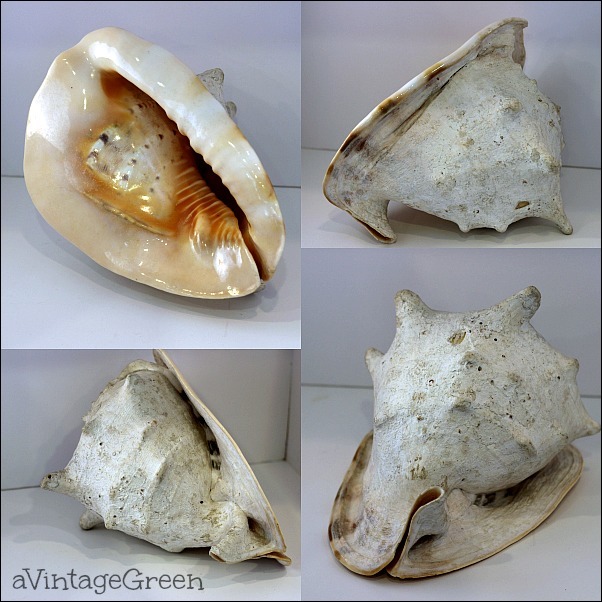 I have a big collection on conch shells. I buy them whenever I see them cheap. They're all over the house. 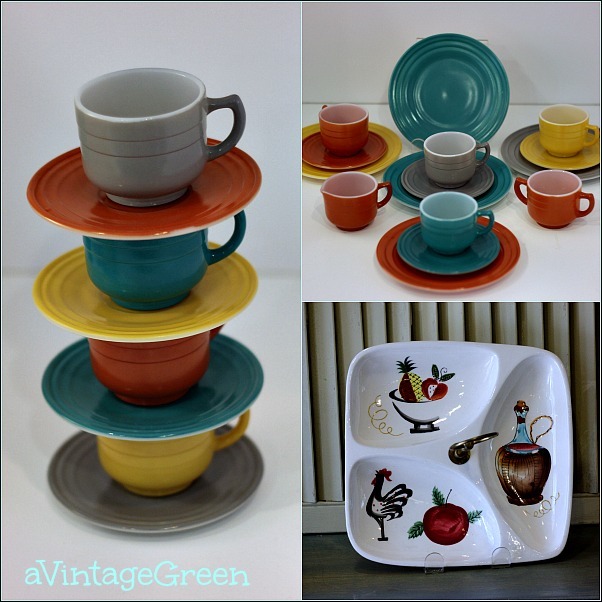 Those Hazel Atlas kid's dishes are a must buy for me when I find them. Nice finds and great pics. I found a homemade carrier like that one time, but it smelled so much like poop that I left it behind. Ew! You've made so many pretty vignettes. I do beielve the shell you're displaying is a CONCH shell. Isn’t it fun finding blues to share? Thanks for playing today. Please come back and tell me what you think of my Blue car post. A nice assortment of great old finds. Treasures. I saw those tea pots and kettles and I was lost in dream land! My favorites! 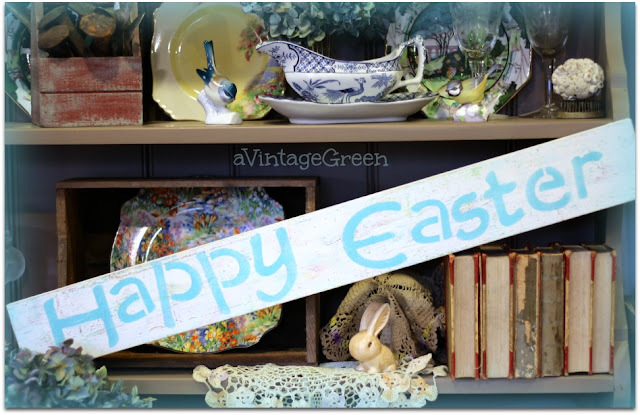 This was a fun filled post with lots of great treasures. Thank you for the share and enjoy a great week! Joy, That's a very good variety of findings. I like the glass bear the best. Sylvia D.
Wow I have a whole set of the vegetable corning ware. And I have a set of the corning ware with the blue flowers. Amazing collection and a good idea to document everything in blog posts. Thanks for linking to Mosaic Monday Joy. Wow Joy ... you found some really nice things. Love the Hazel Atlas Child's Dishes. I have some of the hand painted crock cookie jars. I will have to see if any are marked Ramsberg. You have everything displayed and photographed so nicely. I love all your photo! 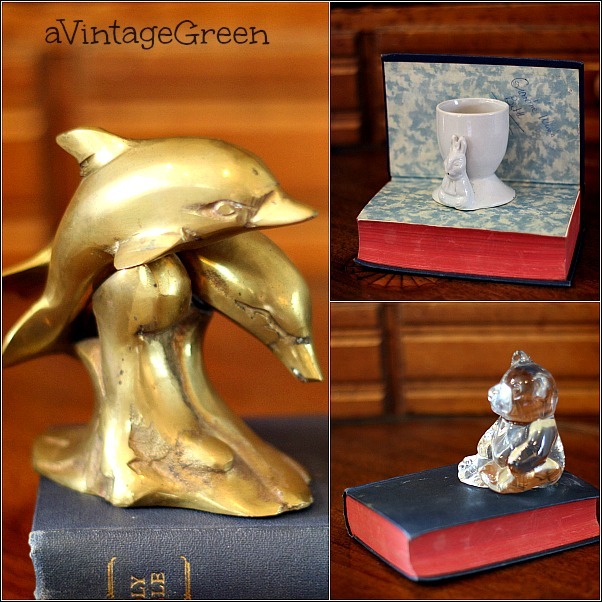 vignettes! I love your tea pots and the vintage rolling pins. Great finds, I want to go with you next time, hehe. Great finds! 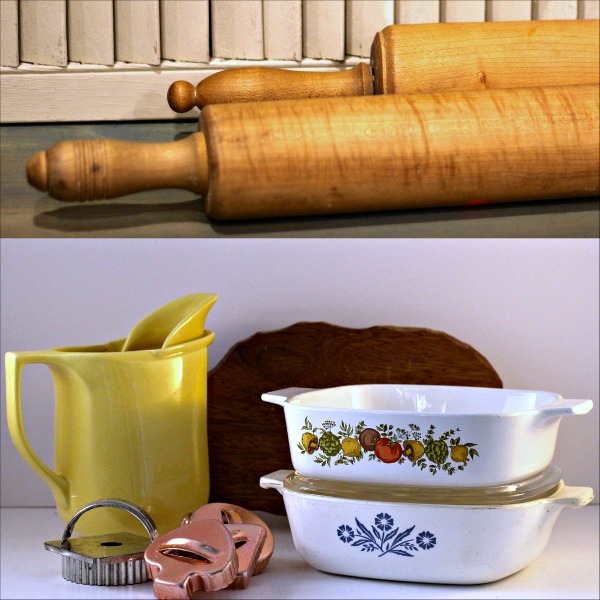 Love your rolling pins and the brass candlestick...so nice! You have a beautiful blog! Found you on the link-up at God's Growing Garden! 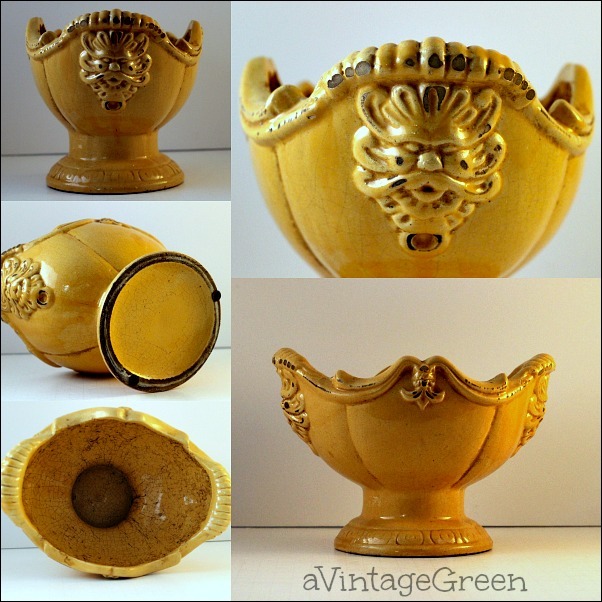 Love your Golden Vignette! Found you on Bella Rosa Antiques. Hello lovely lady! Your photos turned out wonderful and oh so clear! And the items you found are simply deightful! Thank you so much for sharing with Roses of Inspiration - it's always such a joy to have you at the party. Hugs! Wonderful finds. I just love the teapot with the lilacs. We won't get any lilacs till some time around the middle of May here. I don't know what is better--your finds or your pictures. They are both great. I especially love the teapot and the books (Babar AND Beatrix Potter!). 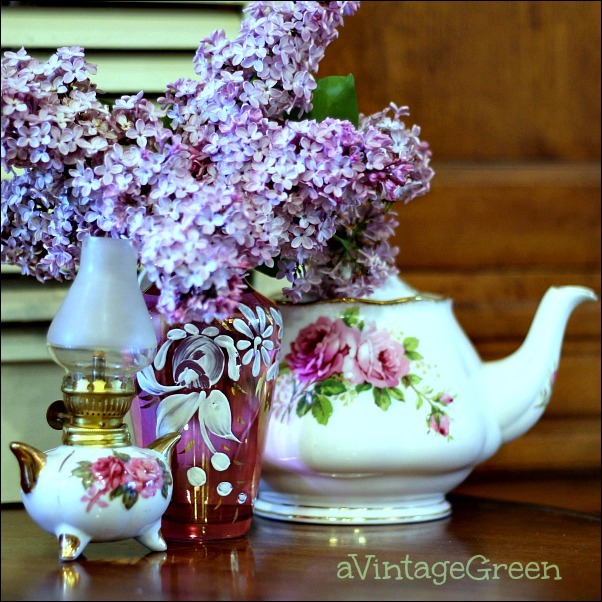 I LOVE the photo of the tea pot and lilacs. Lilacs are my favorite flower. I only wish I could grow them in my yard. I live in NC and they just don't do well here. Wow Joy, you really found some great things! Such a fabulous variety too. Thanks for sharing with SYC.